We have come a long way since the times of Aangrez jails where the only work available to inmates was chakki peesing, as was heard and even seen in movies as to how jail inmates were involved in on-field works. Radiant Infosystems, an Indian outsourcing company, which provides call center services, is all set to employ 250 Indian prisoners into processing insurance claim forms and bank accounts applications for Indian clients. The prisoners are claimed to be from Hyderabad’s Cherlapally Central jail. Gradually, the firm will expand the net to include customers from Britain and United States. In fact, these jail inmates are also targeted to be delegated works in the arena of customer enquiry phone calls in the future. Radiant claims that it is already serving elite global clients such as Marks and Spencer and the Royal Bank of Scotland, as a part of the scheme that envisions helping criminals to improve their work place skills and career prospects as and when they become independent from their punishment term. The company has also clarified that there is no security related threat as the prisoners will have no access to sensitive information including passwords and bank accounts. Though, it sounds outlandishly risky on the face of it; the Indian company has clarified that there are no risks related to sensitive data points. However, the company needs to be agile and alert to ensure that once calls are directly handled by the prisoners (as the company plans to do so, in future); any potential act and behavior does not put the firm’s name at risk of being maligned by the jail inmate. Personally, I also feel that the government or related authorities should maintain a register for the list of prisoners who are involved in providing such outsourcing or any other services on behalf of various companies, for security issues. Other than that, if this step can play its role to make the society a better place to live in, corporate can surely indulge in such innovative yet effective ways of improving society as a whole. What is your take on this highly debatable move ? 1) Rama Linga Raju. Isin’t it Hyderabad jail where he is put up? May be he saw the worthiness of the inmates during his stay and as he still is having connections among industrialists, may be he influenced this company into hiring them. This is entirely my imagination. Just came to my mind thats all. So dont criticize me for liking one and one. 2) In China as huge number of poor from rural western china migrate to eastern industrial china, they go to work for small money. Industries use bonded labor in many industries where the workers are paid two meals and a small cash. This way they are compititive in exports. As India too have many jails with many inmates, why not use this cheap labor (it looks vulgar from ethical point of view) but to stand up to Chinese compitition in exports it is what is required. Chinese bonded labor against Indian prisnors. Anyway nice article. 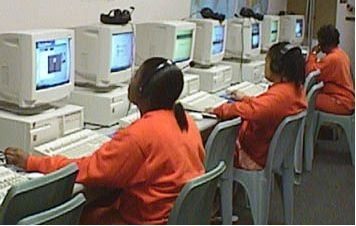 A vast development from the days of angrejon ke zamane ke jails where inmates break rocks to working in front of computers.